Members of the Jeffersonville and Washington C.H. 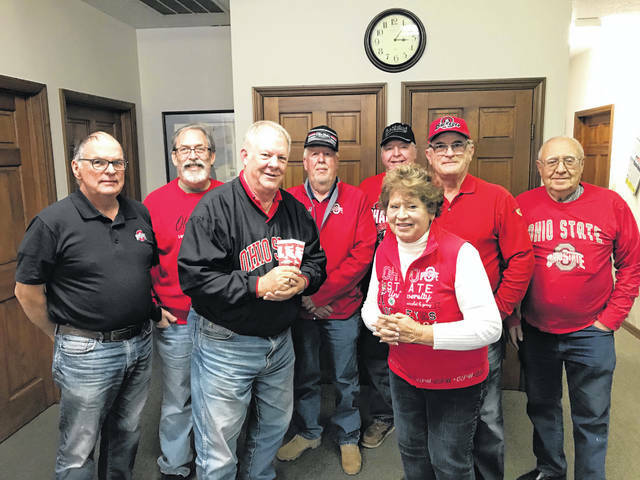 Lions clubs held a raffle at the Record-Herald office Friday afternoon for two Ohio State-Michigan football tickets. Jim Downing, of Jeffersonville, was the winner of the drawing. The Lions Club is holding a “Beat Michigan Tailgate Party” on Friday, Nov. 23 at the Mahan Building on the Fayette County Fairgrounds. Washington C.H. native and former Ohio State Buckeye football player Garth Cox will be the featured speaker.